Mel Allen, Curt Gowdy, and Vin Scully were the iconic faces and voices of the Fall Classic, but the TV director calls the shots. Jackie Robinson dancing off base, Don Larsen’s perfect game, Bill Mazeroski’s home run, Carlton Fisk’s home run, Kirk Gibson’s — those indelible memories are Coyle’s gifts. “If I had my druthers,” he said, “if I had the perfect situation, I would say a Harry Coyle game would make the person at home have the same feeling as the person in the stands.”3 He was the eye of the fan. Coyle had just three cameras for his first World Series, but at least one of them was usually on the blink. Viewers tried to follow the action on 10- or 12-inch screens showing a snowy black-and-white picture. For Coyle’s final Series, 41 years later, he deployed 14 color cameras, plus slow-motion replays. His 36 World Series is one baseball record that’s not likely to be broken. 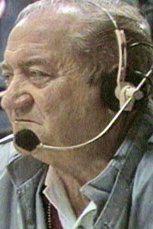 In addition, from 1947 through 1989 Coyle directed 28 All-Star Games and hundreds of Game of the Week broadcasts. He had no offseason. He directed the sudden-death NFL championship game between the Colts and Giants in 1958, the game that made pro football. He worked the first Super Bowl, 11 other NFL championships, 30 Rose Bowl games, and 10 U.S. Open golf tournaments. After his discharge from the Army, Coyle went to work for WABD-TV, the New York station owned by DuMont, a manufacturer of television sets. The development of TV had been halted during the war; only six stations were on the air at the beginning of 1946. Early stations and networks needed sports more than vice versa. Sports events were live, dramatic, and cheap to produce. DuMont, the low-rent network, filled prime time with three nights of wrestling and two nights of boxing. It was also the first to televise weekly NFL games when the NFL was still minor league. New York’s three major league baseball teams began telecasting some or all of their home games in 1947. Video connections for road trips were either nonexistent or prohibitively expensive. The 25-year-old Coyle was assigned to direct Yankees games. Two sponsors, Ford and Gillette, paid $65,000 to televise the 1947 World Series between the Yankees and Dodgers. (The Mutual network paid $175,000 for radio rights.) All three fledgling networks — NBC, CBS, and DuMont — carried the games, but they reached just four markets: New York, Philadelphia, Washington, and Schenectady, New York, headquarters of manufacturer General Electric. Viewers with tall rooftop antennas could pick up the signals in nearby cities such as Baltimore and Wilmington, Delaware. Only about 100,000 TV sets were in use, compared to 80 million radios.6 Coyle didn’t own one; a 12-inch RCA Victor model cost $375, equivalent to almost $4,000 in 2017.7 The announcement that the World Series would be on TV spurred a boom in sales. Coyle joined NBC full time in 1955 and began directing the All-Star Game every summer. Two years later NBC followed CBS into weekly broadcasts on Saturdays and eventually Sundays, although the games were blacked out in major league cities. Technical improvements drove innovation. Cameras delivered sharper pictures and shrank so an operator could carry one on his shoulder; zoom lenses enabled tighter closeups. NBC introduced color TV at the 1955 World Series, but it spread slowly. Color cameras need more light than black-and-white, so the ball disappeared in shadows, and night games were impossible until ballpark lighting improved. Color did not become standard until the mid-60s. Until then the usual shot to start each play came from the “high home” camera behind the plate. Ball clubs resisted and sometimes banned the center field view, claiming that opposing teams would steal the catcher’s signs. Club owners didn’t want the television product to be too enticing; a better view from the couch might discourage fans from buying tickets. The image of Fisk bouncing up and down waving the ball fair, praying it fair, has been replayed so often that many fans don’t realize it wasn’t seen live. The Fisk shot was an accident. Cameraman Lou Gerard, stationed inside Fenway Park’s Green Monster in left field, was supposed to follow the ball, but it was a misty night and he couldn’t find it. He was distracted by a big rat running around at his feet. “See, Lou has one eye on the rat and one eye on the camera,” Coyle said.27 The camera stayed on Fisk. That nine-second shot changed the way television covered sports. Coyle revised his bible to instruct camera operators to hold their shot of the player after the end of the play, to catch his reaction. The reaction shots brought home the emotion of the game. Eventually, that led to look-at-me end-zone celebrations after every one-yard touchdown run. ABC brought an energetic new style to baseball telecasts, adding more cameras and flashy computer graphics. It also brought Howard Cosell, the lightning-rod announcer who had often trumpeted his disdain for baseball. Many baseball fans expressed equal disdain for Cosell. Faced with aggressive competition and criticism that its coverage had grown stodgy, NBC hired an Arledge protégé, Don Ohlmeyer, to head its sports division, and replaced its lead baseball announcer, Curt Gowdy, with Joe Garagiola. But Ohlmeyer didn’t replace the maestro in the truck. He later called Coyle “the greatest baseball director of all time.”31 Coyle won an individual Emmy for directing the 1978 World Series, and NBC began featuring him in press releases promoting its long experience covering the game. As he became an icon in the television industry, Coyle stuck to his roots. “Instead of eating in the team executive room, he would be happier with a Big Mac and a Coke, sitting in the truck with his boys,” said executive producer Michael Weisman. “He called his cameramen his boys, and he was very much one of them.” Some of the boys worked with him for more than 20 years. In 1983 Dodgers announcer Vin Scully came aboard as NBC’s baseball voice, a pairing of legends. The network tried to match some of ABC’s innovations, occasionally with tongue in cheek. After ABC advertised its “Super Slow Mo” in the 1984 League Championship Series, NBC countered with “Super Duper Slo Mo” in the World Series. The 1984 Series was “a pinnacle for televised sports,” Jack Craig wrote in The Sporting News. “…[A]fter more than three decades covering the World Series, director Harry Coyle was still able to come up with something fresh — the eyeball-to-eyeball view of baserunners as they led off first base.”33 For the second time, the Directors Guild of America honored Coyle for the best sports directing of the year. The combined artistry of Coyle and Scully created a landmark moment in the 1988 Series. The Dodgers’ MVP, Kirk Gibson, hobbled by leg injuries, was not in the lineup for Game One. The Oakland A’s took a 4-3 lead into the bottom of the ninth with their near-invincible closer, Dennis Eckersley, poised to nail down the last three outs. NBC field reporter Bob Costas spotted Gibson in the trainer’s room, and Coyle had a camera scanning the Dodgers dugout, building suspense, as Scully wondered aloud whether Gibson might pinch-hit. The Dodgers put the tying run on base with two away. “And look who’s coming up,” Scully said, then let Coyle’s cameras tell the story as Gibson limped to the plate. The 1988 Series was a fitting climax to Coyle’s career. Before the year was over, NBC lost the rights to baseball, outbid by CBS. Under the new contract, the Saturday Game of the Week became the Game of Some Weeks. But Coyle wasn’t done. His career came full circle when he directed some Yankees games for the Madison Square Garden network in 1992. The next year the Directors Guild presented him with its Lifetime Achievement Award. Coyle had a stroke on Valentine’s Day in 1996, and died five days later at 74. The Frick Award winners are chosen by a committee of past winners, historians, and sportswriters. The Hall’s criteria say that it goes to “an active or retired broadcaster.”36 No one but an announcer has ever been considered. Television has brought us November World Series games that last until after midnight, among other things. But the tube is the most important factor in spreading the game’s popularity and building Major League Baseball into a $10 billion-a-year business. For good and ill, its impact is immeasurable. Harry Coyle’s pioneer telecasts set the standard for all who followed. This biography was reviewed by Jan Finkel and fact-checked by Alan Cohen. 1 James R. Walker and Robert V. Bellamy Jr., Center Field Shot: A History of Baseball on Television (Lincoln: University of Nebraska Press, 2008), 283. Much of the information about television history comes from this book. 2 Milton Kent, “NBC’s Coyle knew all the angles, and baseball is forever in his debt,” Baltimore Sun, February 21, 1996. http://articles.baltimoresun.com/1996-02-21/sports/1996052135_1_coyle-baseball-on-television-positions, accessed June 17, 2017. 3 “Harry Coyle,” Sports Broadcasting Hall of Fame, http://www.sportsvideo.org/halloffame/production/harry-coyle/, accessed June 16, 2017. 5 Jeff Kisseloff, The Box: An Oral History of Television, 1920-1961 (New York: Viking, 1995), 132. 6 James L. Baughman, “Television Comes to America 1947-1957,” Illinois History, March 1993: 42. http://www.lib.niu.edu/1993/ihy930341.html, accessed July 31, 2017. Other estimates range from 35,000 to 200,000 TV sets. Nobody really knows. 7 Ad in Wilmington (Delaware) News Journal, September 30, 1947: 16. 8 Jay Breen, “Television Puts New Face on the Bar-Room Floor,” United Press-Des Moines Register, October 1, 1947: 14. 9 Frank Fitzpatrick, “A look back at first TV broadcasts of World Series in 1947,” Philadelphia Inquirer, October 21, 2012. https://web.archive.org/web/20131026043151/http://articles.philly.com/2012-10-21/sports/34607837_1_tv-sets-tv-station-press-box, accessed July 31, 2017. 11 Curt Smith, Voices of the Game (South Bend, Indiana: Diamond, 1987), 107. 12 C.E. Butterfield, “Series Television Broadcast Held Successful Experiment,” Associated Press-Muncie (Indiana) Evening Press, October 7, 1947: 16. 13 B.W. Stewart, “Baseball on Video: Television, Despite Some Handicaps, Scores in World Series Coverage,” New York Times, October 5, 1947: X11. 14 Herbert Johansen, “The Best Seat in the Ball Park,” Popular Science, August 1949: 106. 16 Walker and Bellamy, 293. 18 Smith, Pull Up a Chair: The Vin Scully Story (Dulles, Virginia: Potomac, 2009), 50. 19 Red Barber and Robert Creamer, Rhubarb in the Catbird Seat (Garden City, New York: Doubleday, 1968), 304. Barber, desperate to retain control of the broadcast, devised a board with small light bulbs at each position on the field. The director had an identical board, so Barber could switch on the light at second base, for example, to order up a shot of the second baseman. The contraption, predictably, was too slow and cumbersome for live television. 20 Cathy Harasta, “TV Sports: Baseball proves as tough to show as it is to play,” Chicago Tribune, July 5, 1987: B1. 23 Bob Raissman, “Cooperstown is long overdue to award TV directors,” New York Daily News, October 22, 2016. http://www.nydailynews.com/sports/baseball/cooperstown-long-overdue-award-tv-directors-article-1.2841046, accessed June 17, 2017. 24 Richard Sandomir, “Harry Coyle, 74, TV Director; Pioneered Coverage of Baseball,” New York Times, February 21, 1996: A17. 26 Jacob Pinter and Samantha Raphelson, “He Invented Instant Replay, The TV Trick We Now Take For Granted,” npr.org, January 20, 2015. http://www.npr.org/sections/thetwo-way/2015/01/20/378570541/he-invented-instant-replay-the-tv-trick-we-now-take-for-granted, accessed January 23, 2017. 28 Jack Craig, “Record 75.9 Million Saw Series TV Finale,” The Sporting News, November 22, 1975: 55. 29 Shirley Povich, “Populace Reawakens to Baseball’s Skills, Thrills,” Washington Post, October 25, 1975: B1. 30 Benjamin G. Rader, In Its Own Image: How Television Has Transformed Sports (New York: Free Press, 1984), 100. 31 Don Ohlmeyer interview, Archive of American Television, http://www.emmytvlegends.org/interviews/people/don-ohlmeyer, accessed April 24, 2017. 32 Michael Weisman’s speech at Coyle’s induction, “Harry Coyle,” Sports Broadcasting Hall of Fame, http://www.sportsvideo.org/halloffame/production/harry-coyle/, accessed June 16, 2017. 33 Craig, “NBC’s Series Coverage Glorious,” The Sporting News, October 29, 1984: 12. 34 Kenneth Sharp, Coyle’s stepson, telephone interview on July 27, 2017. 35 Associated Press, “Harry Coyle, TV Pioneer, Dies,” St. Louis Post-Dispatch, February 21, 1996: C5. 36 “2017 Ford C. Frick Award Ballot Finalized,” National Baseball Hall of Fame press release, November 7, 2016. 37 Neil Amdur, “Harry Coyle’s Book,” New York Times, October 4, 1983: B11.